Source: Quirk Books/Netgalley – I received this in exchange for an honest review. So I’ve seen some vitriol aimed towards this book, which was a bit disconcerting, and I did go into this expecting someone to be telling me what I should do and how to do it…and it to be very demanding and not what is advertised. That’s not the case guys, not at all. 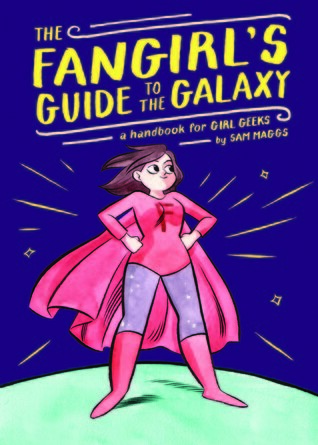 Fangirl’s Guide to the Galaxy is a all access pass to the world we love, and none of the things mentioned in here (other than the do’s and don’ts of a convention) are written in such away that they truly tell you to do anything. It’s a guide, not a rule book. So sit back and enjoy it, and get excited about your fandoms all over again. Fangirl’s Guide goes over so much that I’m surprised they fit it all in one book. There are sections about fandoms, fanfiction, cosplay, conventions, events, and internet communities; along with little interviews with well known and well respected geeky women. It doesn’t go into to extreme detail about each fandom or tell you which fanfiction to read, but it does give you a nice bit of information to use and go on when exploring the geek universe. Never been to a convention? There is a section for that, it tells you what sort of things to expect and the basic decorum expected of you. It even includes a list of the major conventions for most geek types. Never cosplayed before? No problem, there is a section to help you feel at home with the idea and give you a few resources in the back for some great sites. Want help opening up and finding people in the real world who share your passion? There is some help with that too, including how you can host events and even gently push your passion on your non-fandom friends without being overbearing. This book is also unapologetically feminist. Now before some of your run away, it’s not the feminism that’s been generalized as militant and it doesn’t call for the head of every man ever. This is about being you and never taking less than you deserve, no matter who you are or what your gender is. In the back of the book it even gives you some great links and references for sites to check out from news to geeky clothing. And to top it off some fantastic recommendations for amazing women in media like Captain Janeway in Star Trek: Voyager or my personal favorite Lina Inverse from the anime Slayers! In short this book is about acceptance and loving who you are. Shout your geekiness from the rooftops and never ever let someone tell you that you’re not a geek. Never allow them to quiz you like you don’t belong. So if you’re a geek girl who has been stifling her passions, let it out, and if you’re a geek girl who is proud and loud of what she loves keep being awesome. This entry was posted in Book Reviews (2015) and tagged 5 stars, non-fiction, review. Bookmark the permalink.